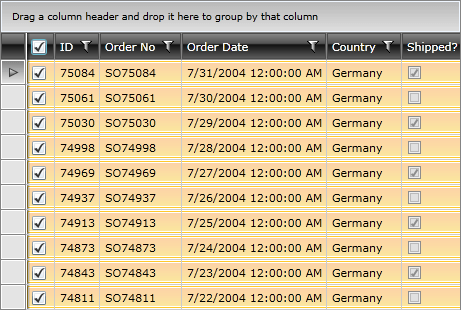 The RadGridView's API offers you a GridViewSelectColumn, with the help of which you can perform a selection via CheckBox. The purpose of this tutorial is to show you how to achieve this behavior. Here is a RadGridView declaration, which is populated with some sample data. The grid is shown on the next figure. Enable multiple selection for the RadGridView. 2. Add an additional GridViewColumn of type GridViewSelectColumn. Here is the final result. When you select the CheckBox Header, then all rows will be automatically selected. When you want to use selection via checkbox, then:1. Set the SelectionMode property to Extended or Multiple. Leaving it to Single you won't be able to select all of the entries in the RadGridView.2. Add a GridViewSelectColumn. 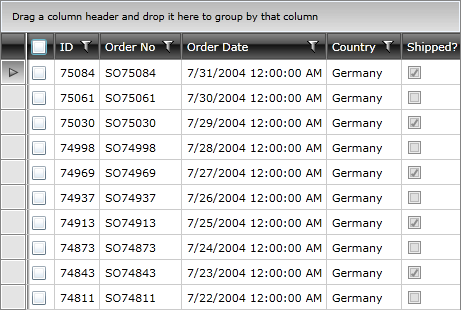 If you need further information for the GridViewSelectColumn and all other provided columns take a look at the this topic.